Sunday, April 15 – The Cincinnati Buckeyes opened their 2018 campaign on the road in Dayton, OH, where they took part in the Roundhouse Rodeo event at Eastwood MetroPark, hosted by the Eastwood Iron Horses. The event featured five teams (a sixth had dropped out due to the weather), and despite the cold and wet conditions, a lot of fun base ball was played. The Buckeyes had the luck of the draw this day, securing the last two games of the day, when the weather happened to be the driest and their opponents – the Bluegrass Barons of Lexington, KY, and the Iron Horses – were well worn from a full day of base ball in some tough conditions. The Columbus Buckeyes and Cincinnati Red Stockings were also part of the event. For the Buckeye’s first visit to the “Railyard”, the Cincinnati nine were thoroughly impressed with Eastwood’s hospitality and pork-smoking, and we congratulate them on a fine day of base ball for all of those involved. Huzzah to Eastwood! NEXT UP… The Cincinnati Buckeyes travel north this Saturday to Columbus, OH, to face the Ohio Village Muffins at the Ohio History Connection. Game times for the double-header are 1:00pm and 2:30pm. 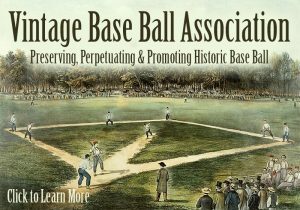 PLAYERS WANTED… The Buckeyes still have openings for any player (male or female, young or old) who would like to join us in playing the grand sport of vintage base ball. Simply contact us and find out how you can join the team.